Firefly's was a new find for me. A friend suggested we check it out this past weekend, and so off we went to Marlboro, MA. This place is HUGE. Most the BBQ joint's we've been frequenting are small, cramped and full of character. 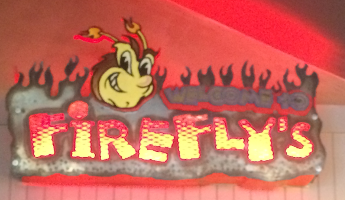 Firefly's has a massive parking lot, a huge full service bar as well as an expansive dining room. We were seated quickly and waited on by a friendly waitress. It was nice but a lot different than the usual "wait in line, place an order" establishments. They have a large selection of BBQ sauce. I take offense at their "Texas" BBQ sauce. It tastes strongly of tomatoes and vinegar, unlike any sauce I've ever had in Texas. Their spicy Memphis sauce was not bad, and their North Carolina sauce went well on my pulled pork. The meat itself was fine. Not the best, and not the worst. The brisket had nice smoke rings and a reasonable amount of smokey flavor. The pulled pork was quite good, but I was really missing the South Carolina style sauce that I prefer with it. The sides were quite good as well. The homemade pickles were my favorite! 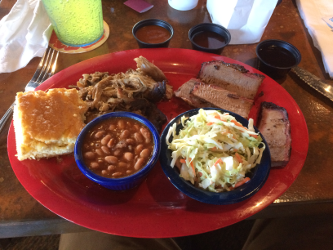 Overall, its a great BBQ joint in a more normal restaurant style setting.